Click on "Ubuntu Help", it shows the error "document not found". Consider this as release-critical. As per ubuntu bug policies, critical priority means that it causes data loss or renders machines unusable. Adjusting the priority accordingly. Issue not fixed, see the installation log at http://paste.ubuntu.com/7269077/ for details. It's because the package which is installed from the hook in ubuntukylin-default-settings is marked for removal at the end of the installation. Trying to think of a way around this. One problem is that ubuntu-kylin-docs has a Conflicts with ubuntu-docs, and the latter is part of Task: ubuntu-desktop which is installed when the image is built. This precludes installing the package directly either from ubuntukylin-default-settings or in livecd-rootfs. Unless anyone has a better idea. Steve, I know you're involved with Kylin stuff - thoughts? Iain, I thought ubuntukylin-default-settings already had support for removing packages that had previously been isntalled from the ubuntu-desktop task; this is one of the facilities that ubuntu-defaults-builder is supposed to provide. Am I missing some reason that this isn't sufficient for the ubuntu-kylin-docs case? > sufficient for the ubuntu-kylin-docs case? wouldn't be very easy to add it properly. hook to poke around in the internals of the image build process. > > sufficient for the ubuntu-kylin-docs case? > wouldn't be very easy to add it properly. > hook to poke around in the internals of the image build process. ubuntu-docs is already listed there, though. handling to a seed + meta package. > ubuntu-docs is already listed there, though. can't be done in that way because of the Conflicts to ubuntu-docs. > handling to a seed + meta package. 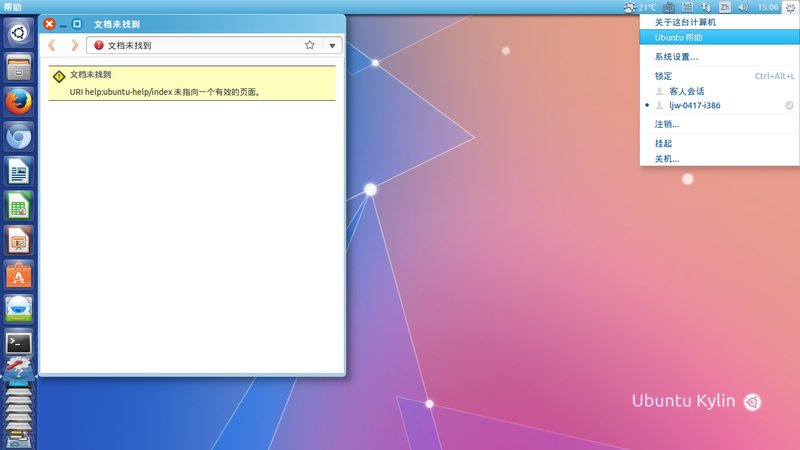 Hi, steve, about ubuntukylin seed+meta, i have send mail to you, hope you can take a look ^_^. Thanks! in the live session , 'ubuntu help' display right ，after installed，‘ubuntu help’ did not display, and ubuntu-kylin-doc did not installed.